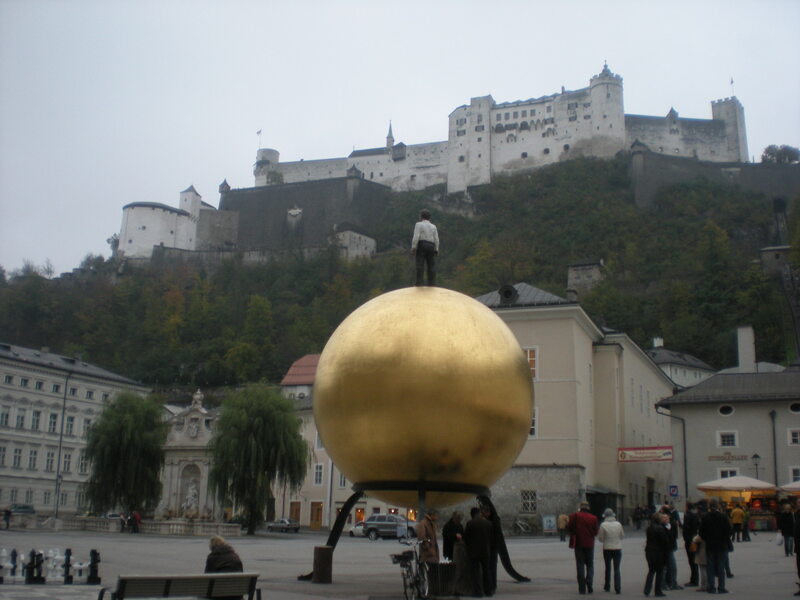 I’m sitting here staring at a blank document just trying to find good words to describe Salzburg, and honestly I keep coming back to fairy tale. I mean how many thousands and thousands of dollars went into that MFA, and “fairy tale” is the best I can come up with? But it’s either that or blank page. 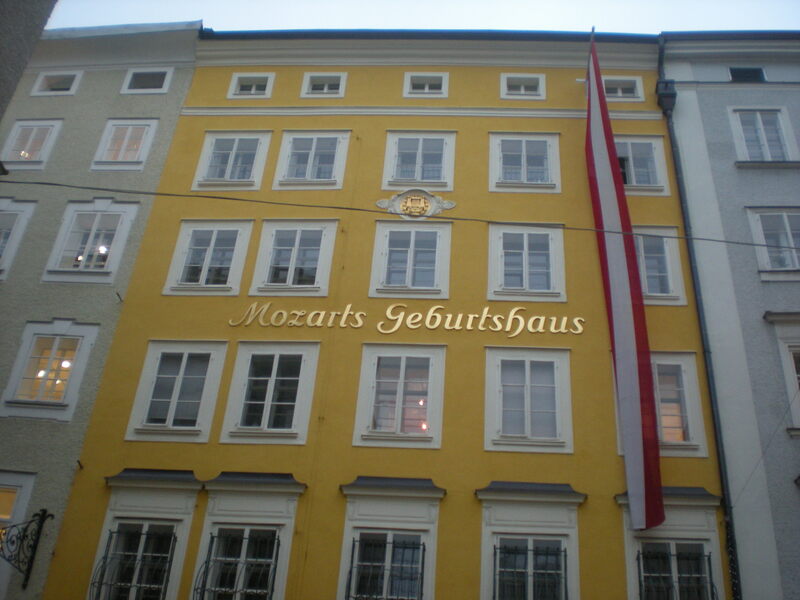 And blank page won’t suffice either because I want to express clearly how incredible our weekend was in Salzburg. 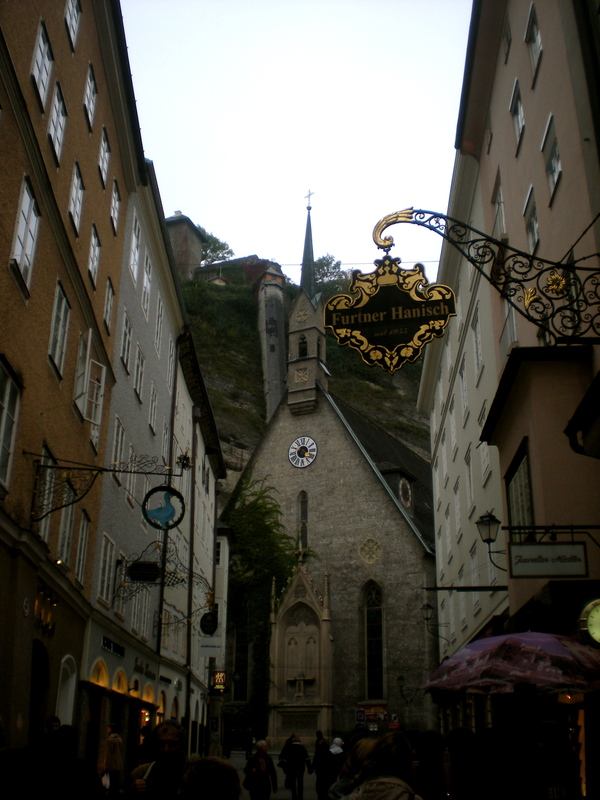 So it will have to do: Salzburg was a fairy tale. We left on Friday morning. It was a little cloudy in Budapest, and remained so for the majority of the trip. 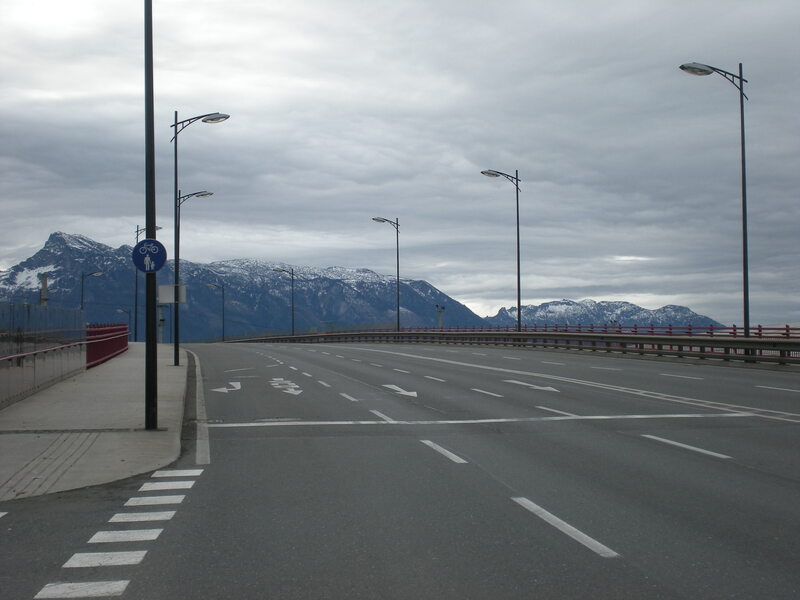 And you have to understand that cloud cover really does make you a little unsure of the place, especially since an hour after crossing the Hungarian boarder into Austria, you should start to see some mountains. 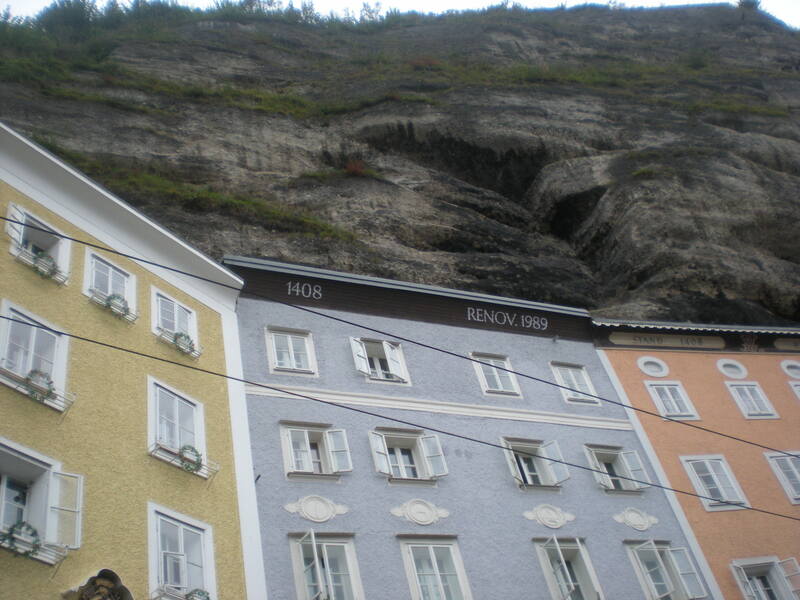 If you haven’t been, trust me, you’ll know the Alps when you see them. 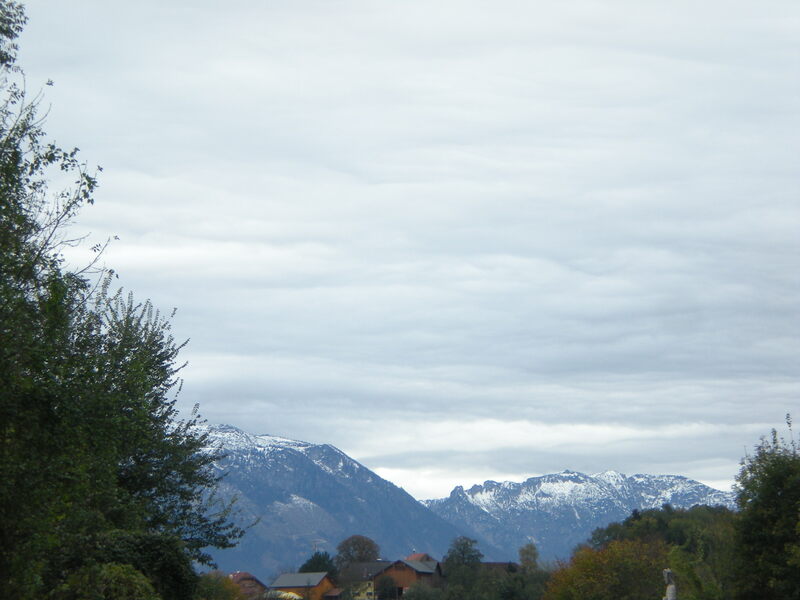 The Alps (latin cognate, Alex, “albus”—white!) are very very. Not that you can see the Alps that far across the boarder, but the terrain and the elevation begins to change drastically. Unfortunately we couldn’t really tell because of the weather. I did however spend a little time explain advection fog to Györgyi and was surprisingly perplexed when she fell asleep in the passenger seat. 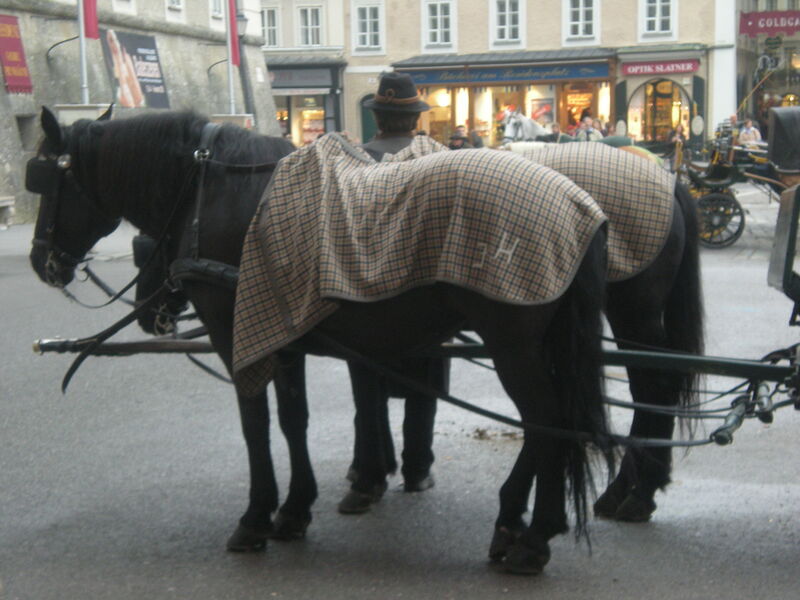 But despite fog and construction and Germans driving 200 mph, we got into Salzburg without much fuss about five hours after we left. 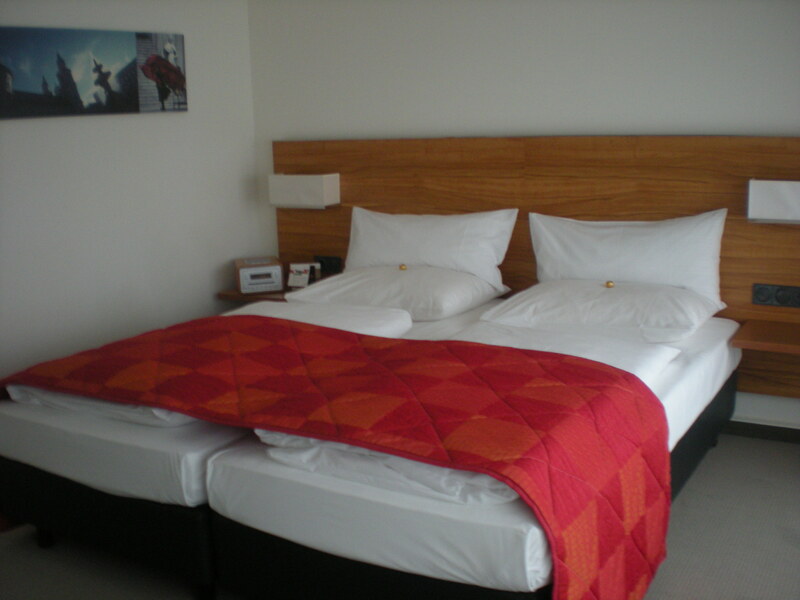 We stayed at the Castellani Park Hotel, which I booked partly because of our IPrefer membership and partly because we really love this group of hotels. 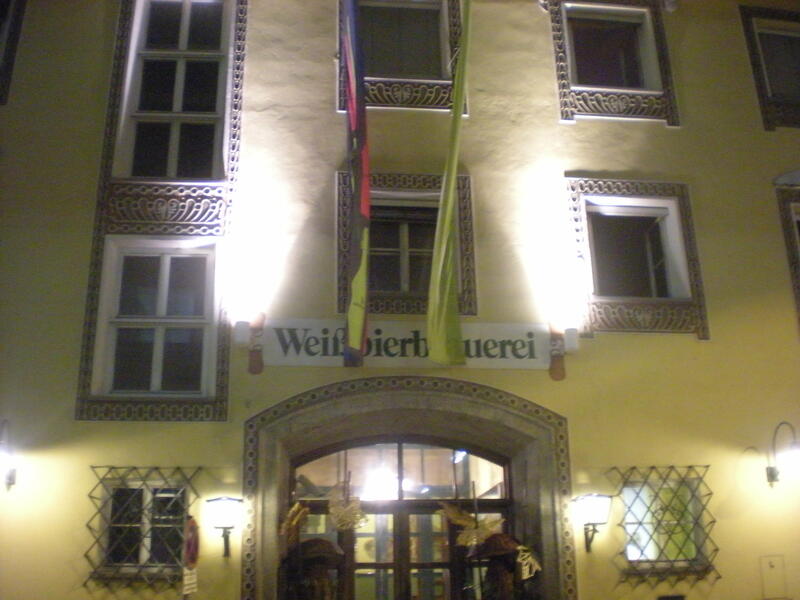 They are not paying me to write this, but we have always had good experiences, in Poland, Czech Republic and now Austria with these hotels so I really recommend them. Also, sigh up for the IPrefer membership rewards number and you get all sorts of extras. 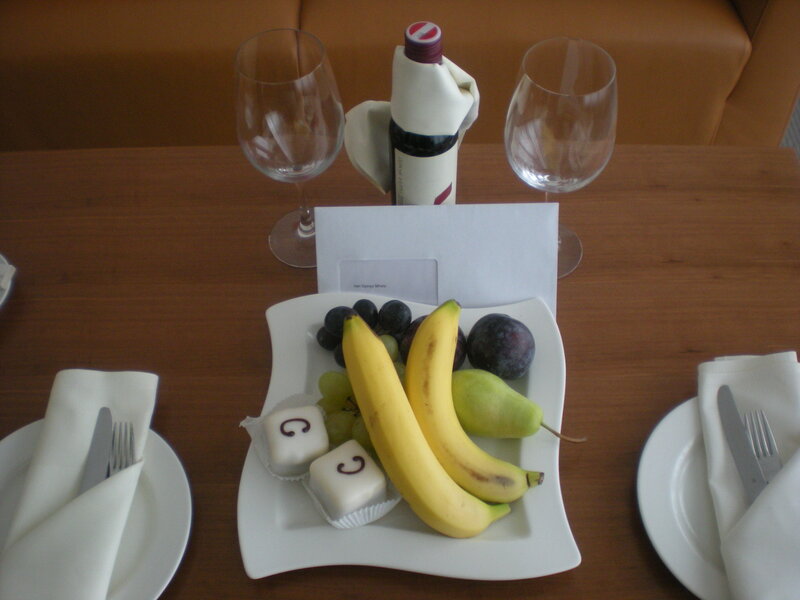 They gave us free cakes, fruit, wine, and a free upgrade to a Junior Suite on this particular trip. 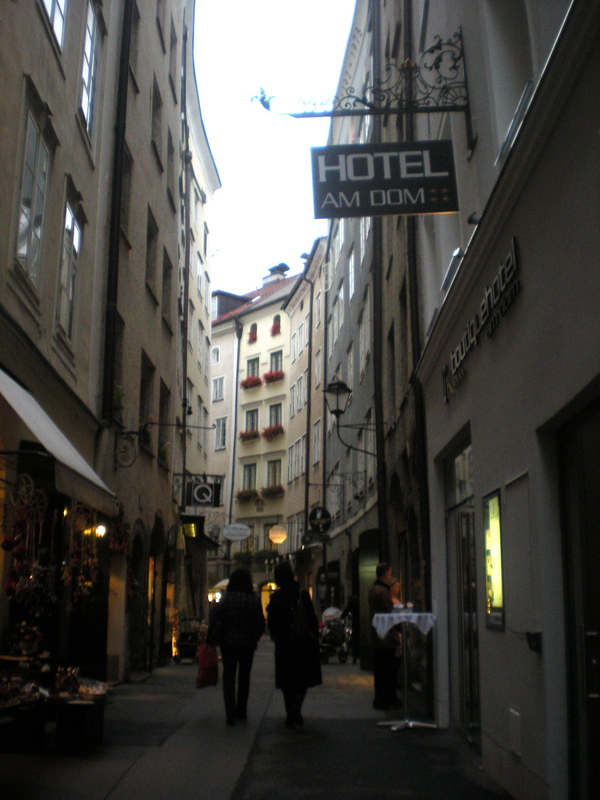 And even though the hotel was about five minutes outside of Old Town (5 Euro cab ride if you don’t have a car), the view was beautiful, the neighborhood was quiet, and the hotel and its staff were lovely, gracious and helpful. 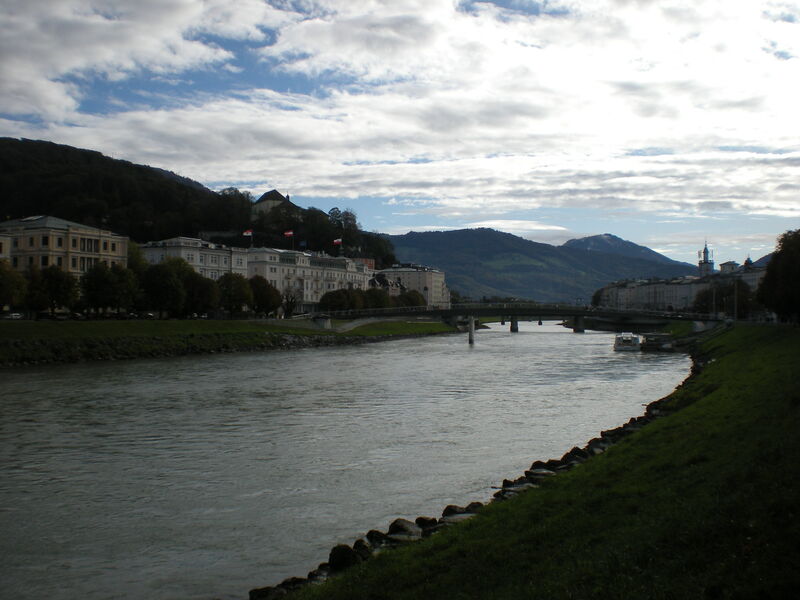 Salzburg is on the banks of the Salzach river and on the northern boundary of the Alps. And it is not a big city (only a little over 100,000 residents). 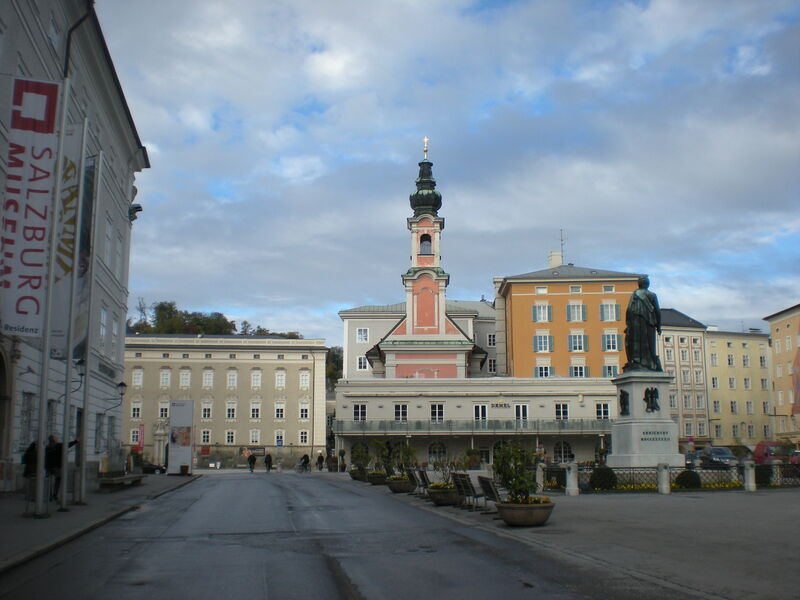 But it is clear to me now why it is one of the most popular tourist destinations in Europe. We set out from the hotel around 4pm so it was already getting dark. 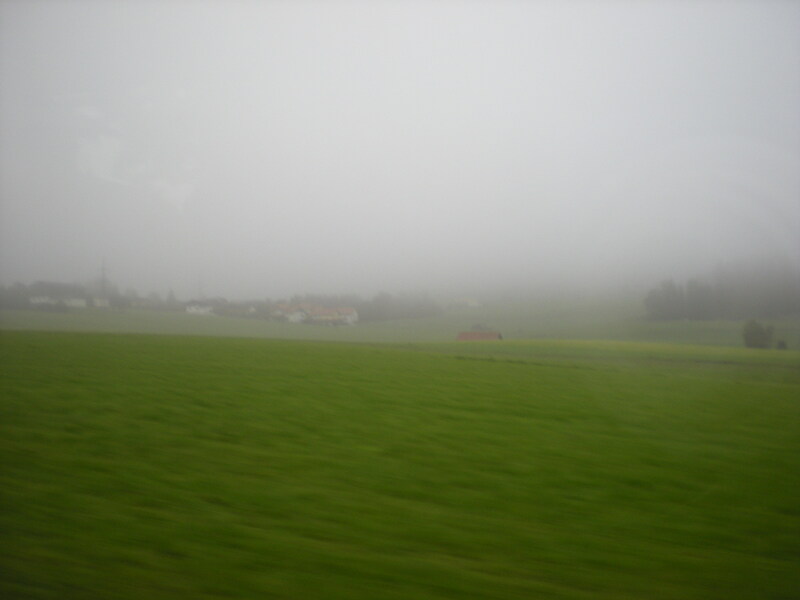 So while I want to show only the sunniest, Alps(iest), greenest pictures, I’m going to post in order of what we did. And when we were in the old city at 4, it was dark, a little cold, though not raining. These facts did not seem to deter anyone though from their evening strolls through the medieval part of the city. 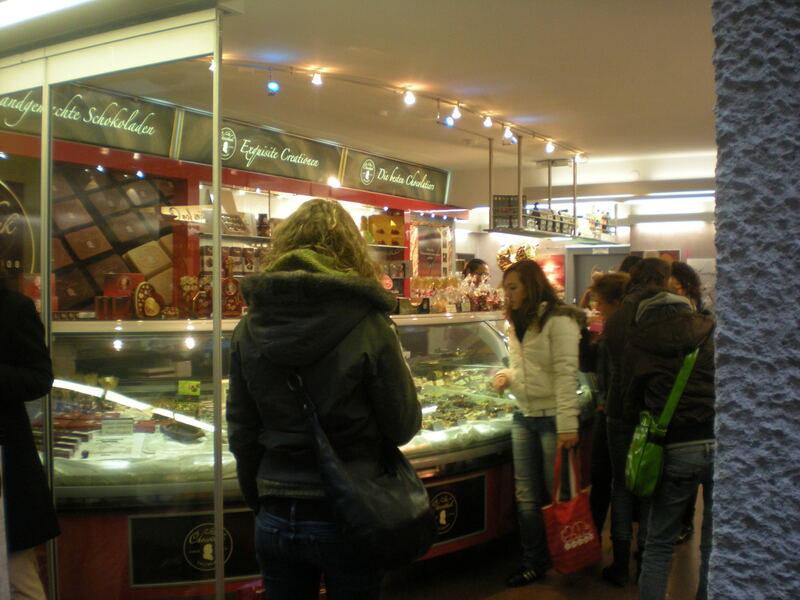 One of the first things that we saw was the huge crowd swarming in and out of the chocolate store. 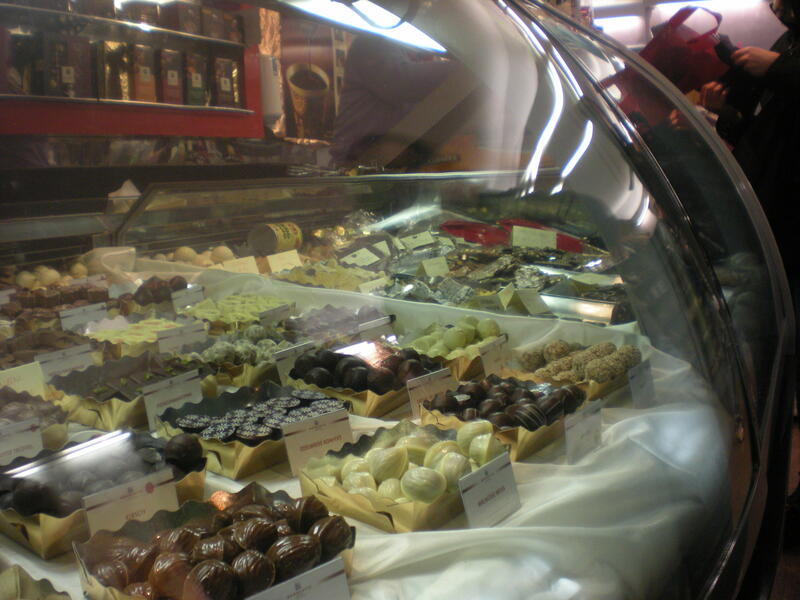 So even though we have been trying to watch our chocolate intake of late, we didn’t think it would be right not to go in for a few morsels. I mean I didn’t want to personally insult Salzburg on my first visit. 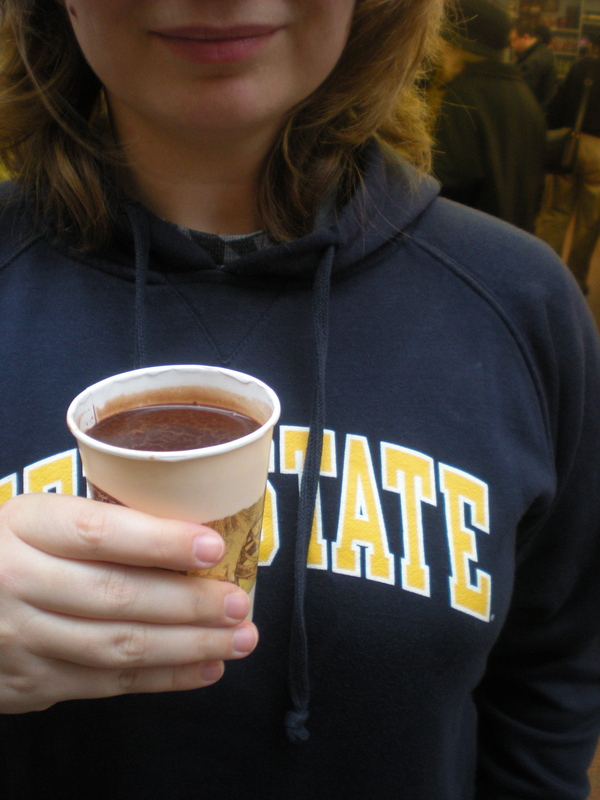 And because her hands were cold (and only because), Györgyi got a cup of hot chocolate. Just imagine taking the most delicious chocolate bar you have ever had, melting it, warming it up so it steams, and then putting it in a cup to drink. That’s what it was. Swoooon. 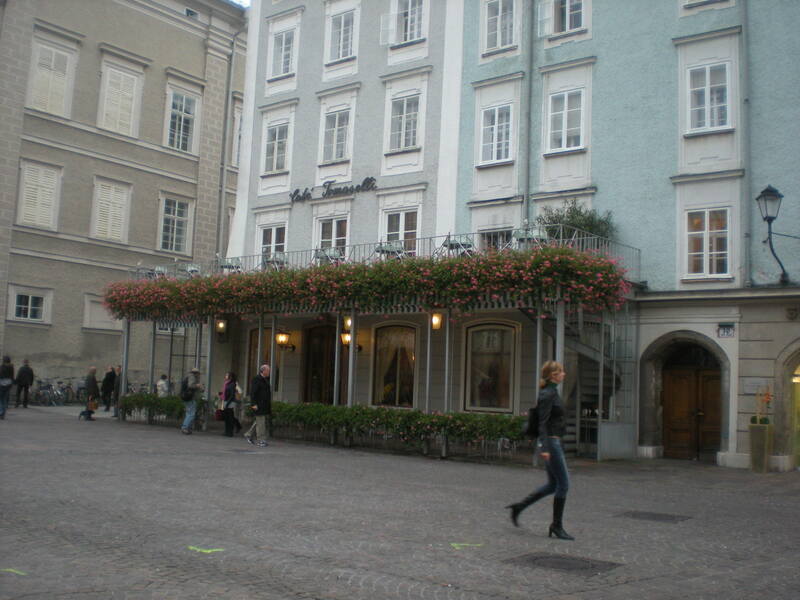 We strolled around the old town for a while, just looking at the beautiful buildings and taking in the town. 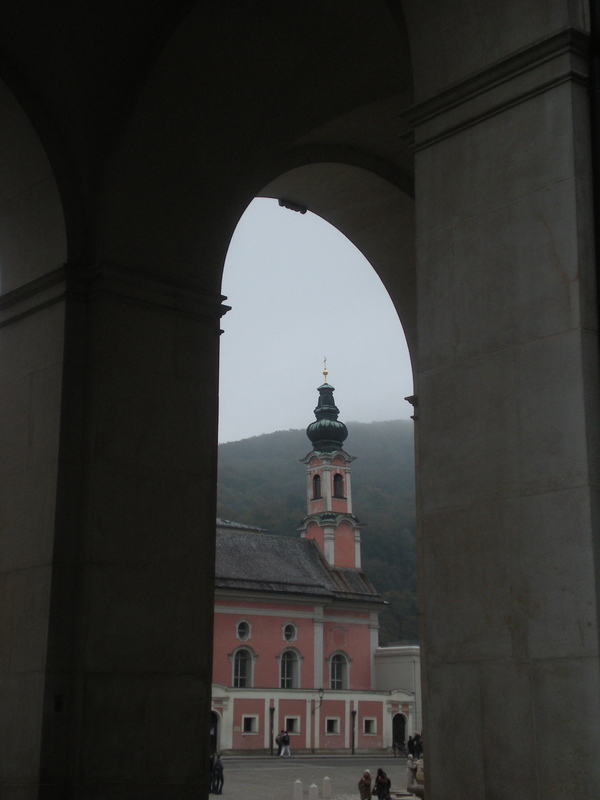 Even with the fog and gray, the sites were lovely. 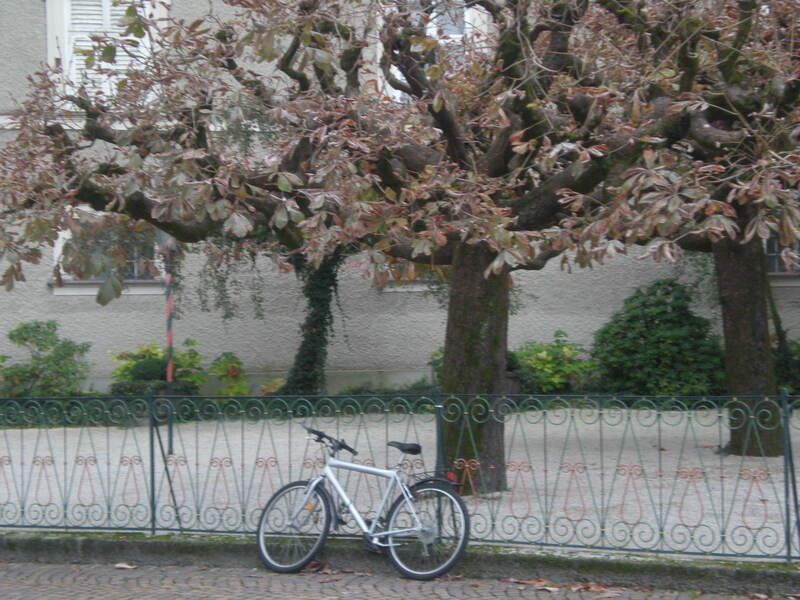 And there were so many people outside walking around, eating chestnuts, sipping cappuccinos at outdoor cafes and practicing their German phrases. I don’t know why, but I’ve never had a roasted chestnut before. So finally I tried some because there were many street vendors selling them. One bag, 3 Euros. So delicious. 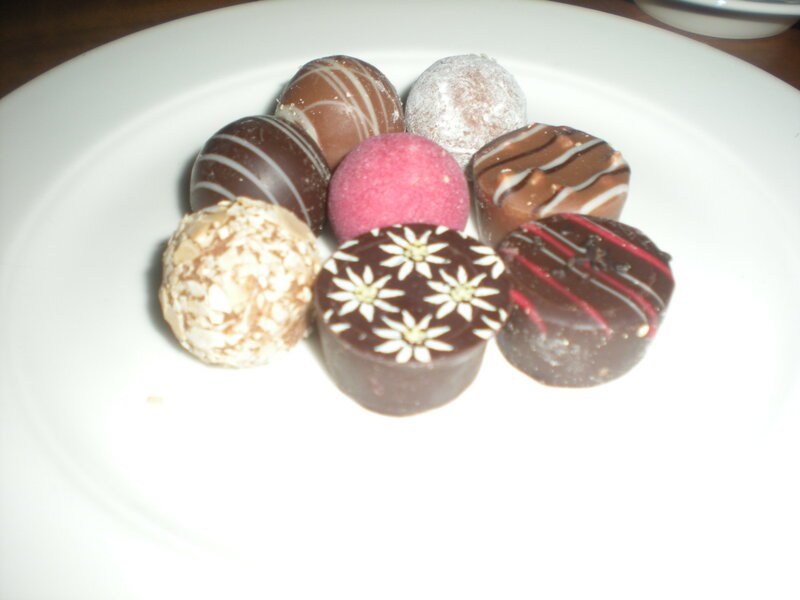 Nutty, soft and sweet. 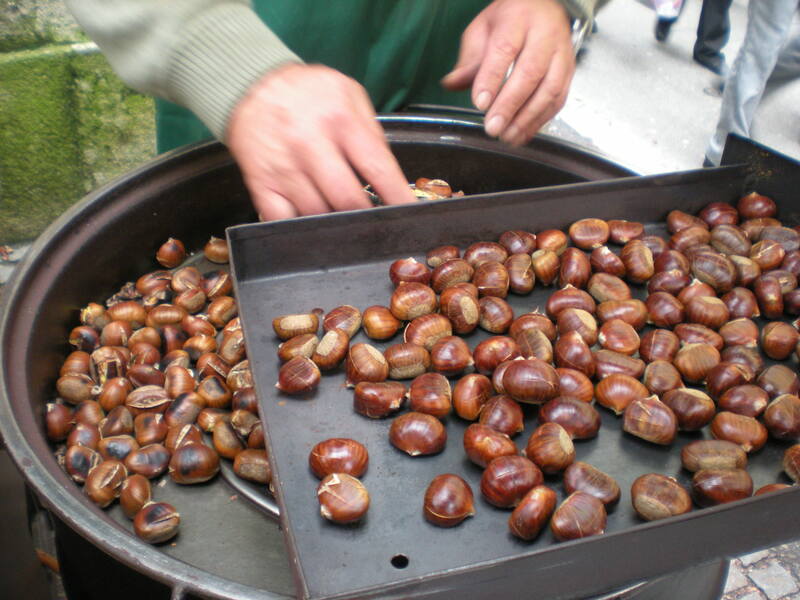 It’s not really that much of a tradition in America, and it’s a shame because they seem like the perfect fall/winter street food. As we were walking, we heard “Hey, Kent State!” We happened to stumble upon some Ohioans enjoying a cake outside at one of the sidestreet café. They were a young couple who went to Ohio State and now live in Belgrade with their four small children. We chatted with them for a while, and when I walked away I was just smiling really big and wide. Not only was it nice to meet up with some Americans, but the more time I’m away, the more I realize how wonderful the Midwestern attitude for friendliness is. I said to Györgyi, “that’s Ohio,” and now that’s she’s been home with me, I think she knew exactly what I meant. 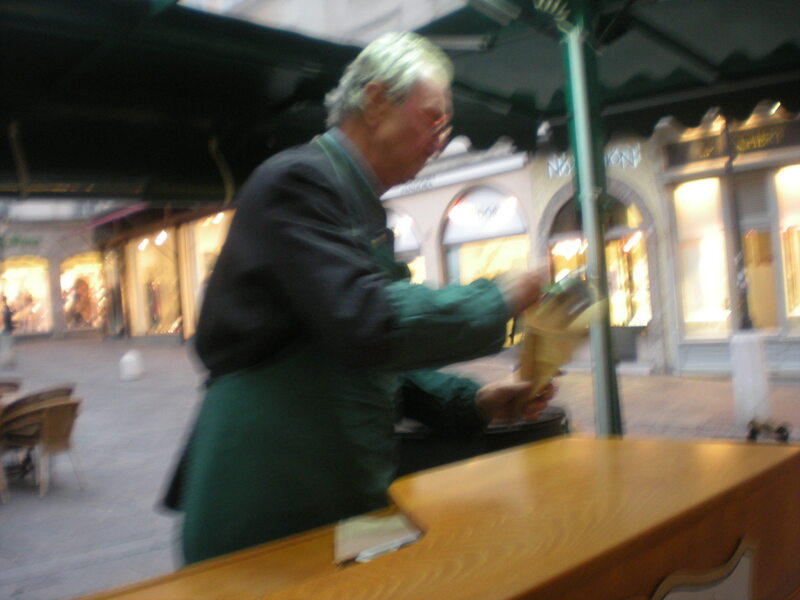 So we bought the chestnuts outside of Mozart’s house. Though because it was late, the house and tour was closing, so we had to save it for Saturday. Which gave us the perfect excuse to head back across the river, to the restaurant I had picked out for us for the night. Before I travel anywhere, I check tripadvisor for restaurant recommendations. 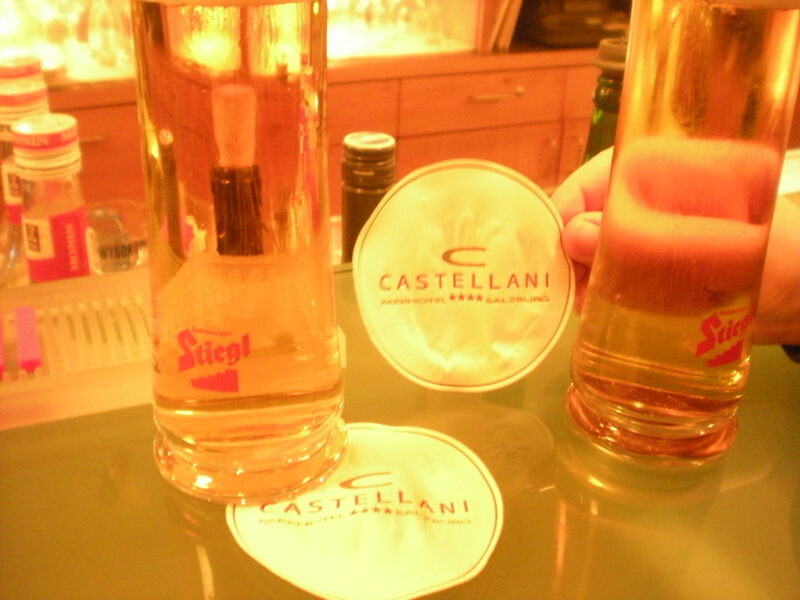 If you’ve never used it, I really give it high marks, and seem to always find a local place with good food and drink. Sometimes this means having to get out of the touristy city-center, but in my experience it is always worth it. 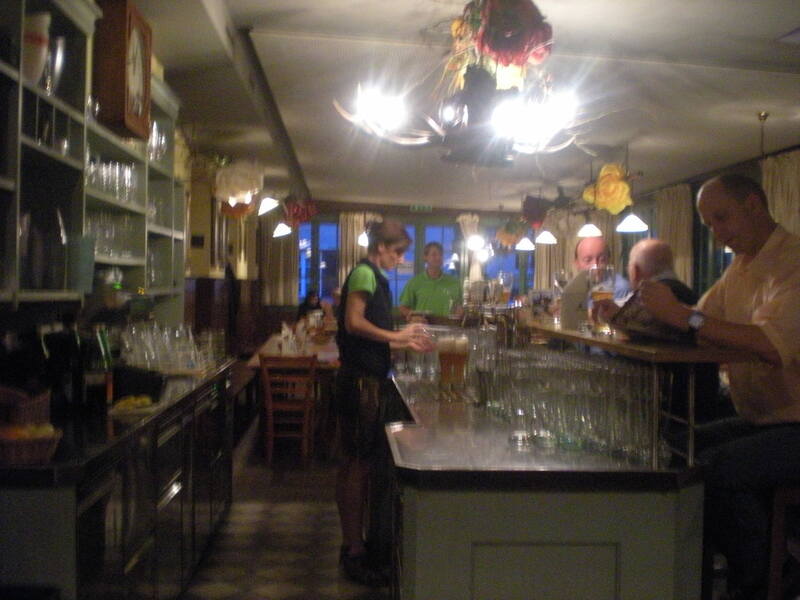 So based on the recommendation of travelers around the world, we headed to Die Weisse (website in German only). Rupertgasse 10, +43 662 8722460 Reservations recommended for sure, especially during high season. 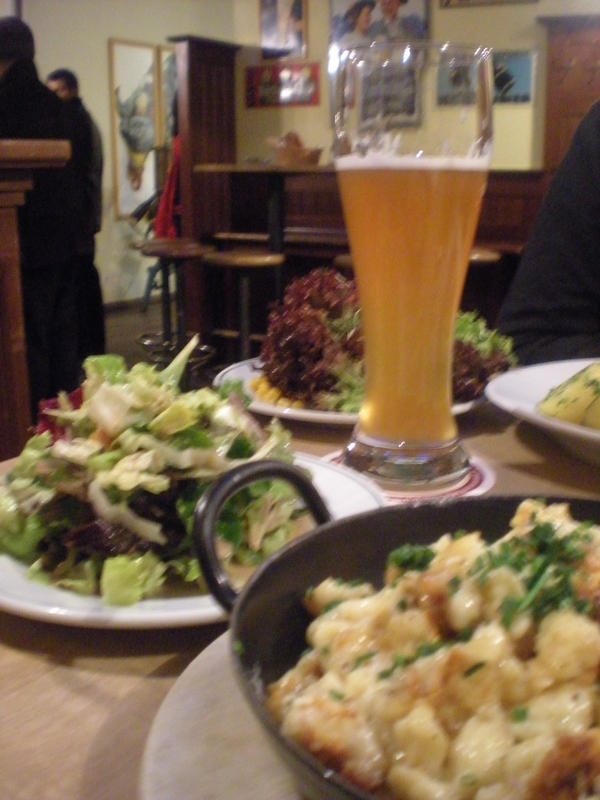 The reviews said it was the best beer garden in Salzburg and they had good food to boot. And honestly it was a total blast. The waiters wore these leather Austrian shorts and were very friendly. 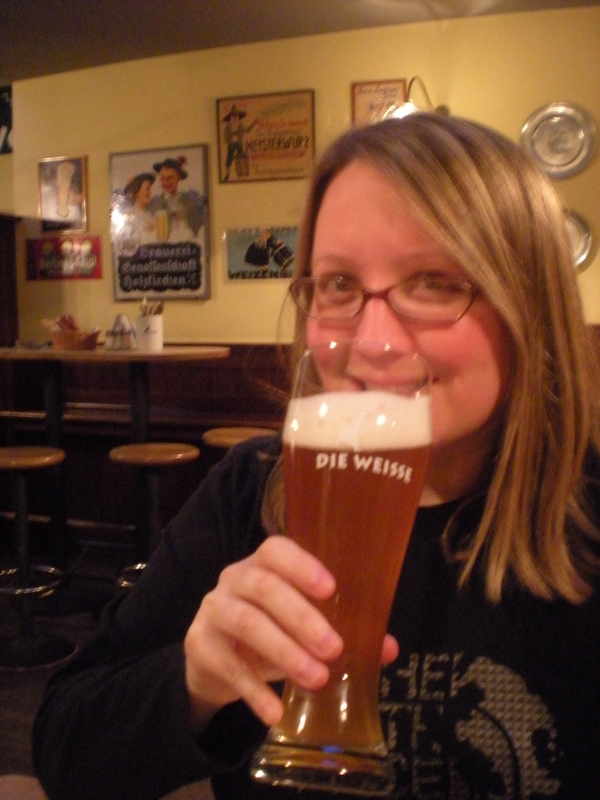 And their homemade light and dark wheat beer was so delicious. 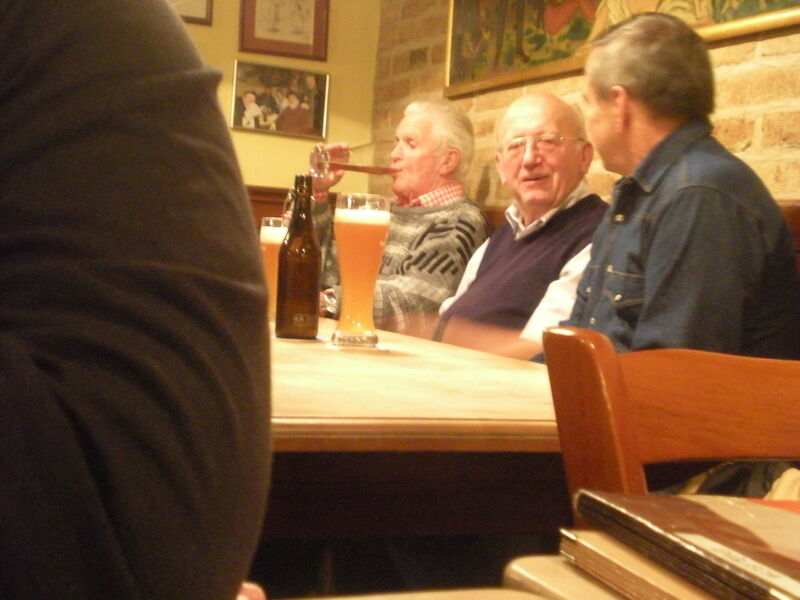 Even Györgyi, a real non-beer drinker, kept wanting to go back for more. Györgyi ordered what was essentially Austrian mac & cheese. So it was dumplings, cheese, bacon, and herbs baked in a little pot and served hot. Where the cheesy dumplings met the sides of the pot, they were a little crispy. Oh there was also a salad, but I think it was just there to ease the conscious a little bit. And I’ll have to check with her, but I’m pretty sure this is her death row meal now. 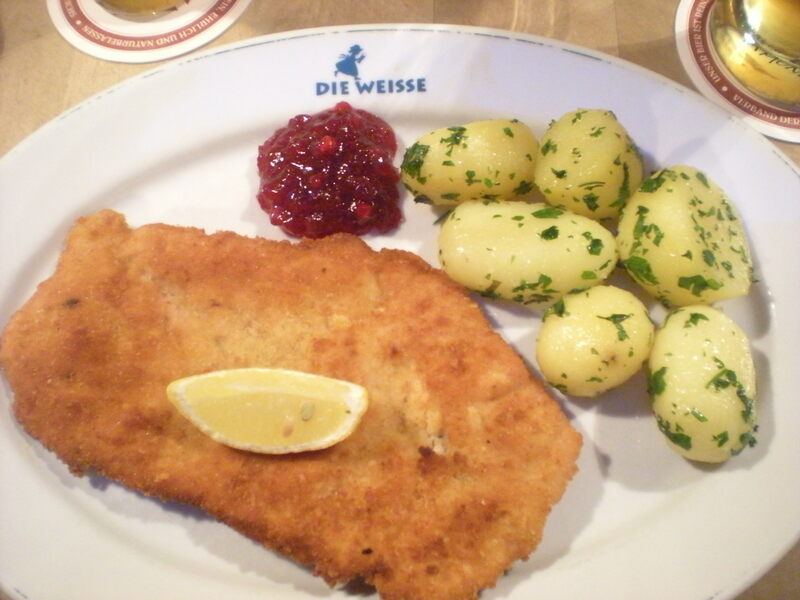 I ordered an equally incredibly delicious meal, which was the Wiener Schnitzel and a side salad that included cucumbers and cabbage. I highly highly recommend this restaurant. Yes, that was two highlyies. The next night we met an Irish couple in Old Town and practically forced them to go there after they asked where we had eaten and if we had any recommendations. 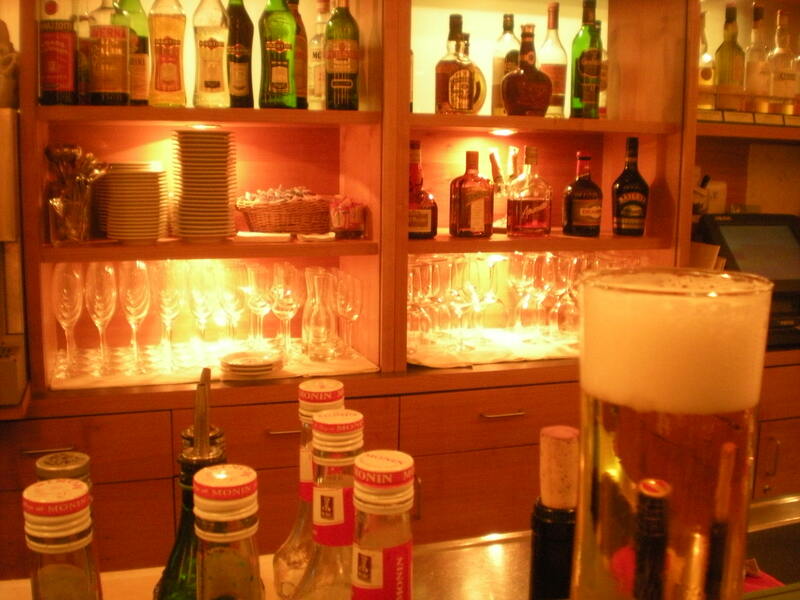 So as it had already been a long day, we headed back to the hotel for a nightcap (i.e—Steigel beer) at the cute hotel bar. 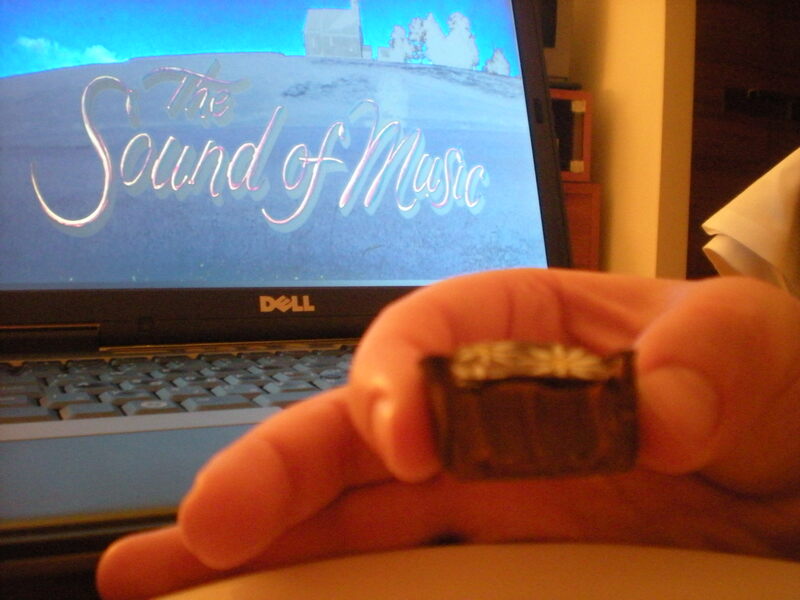 After our beer, we went back to the room and had a few chocolates while watching The Sound of Music. Why, do you ask, did we watch the Sound of Music? (As if it being the best movie musical ever isn’t enough of a reason.) 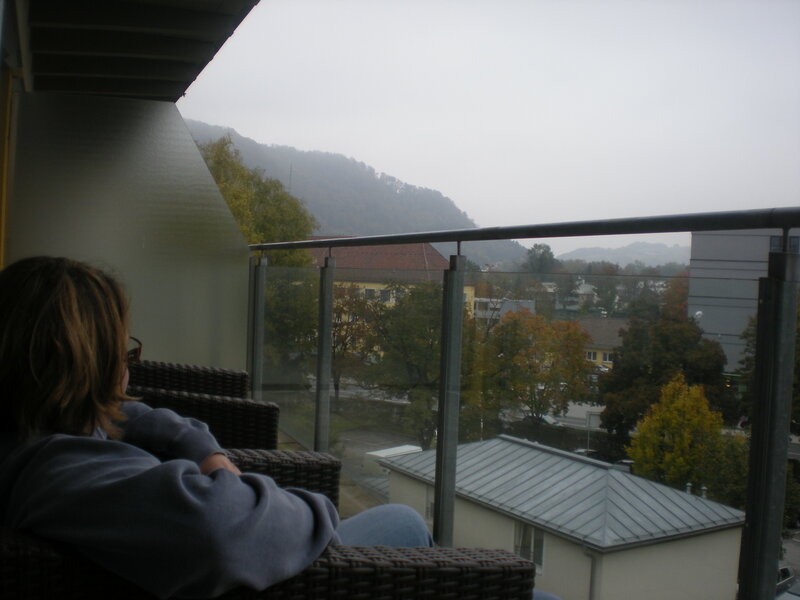 Because…the next day…we had to be up bright and early for the Sound of Music tour of Salzburg. Looks like a great trip and beautiful country. I’m looking forward to reading more. I’m also looking forward to strudel and beer (among other things) this fall. And — “hey, Kent State” — can’t beat that. Tell Gyorgyi that by wearing the Kent State sweatshirt she brings a smile and cheer to all of us alums and faculty members. It’s one of those places that it’s hard to take a bad picture, I think 🙂 You don’t even have to look into the view finder– just point the camera up and snap! 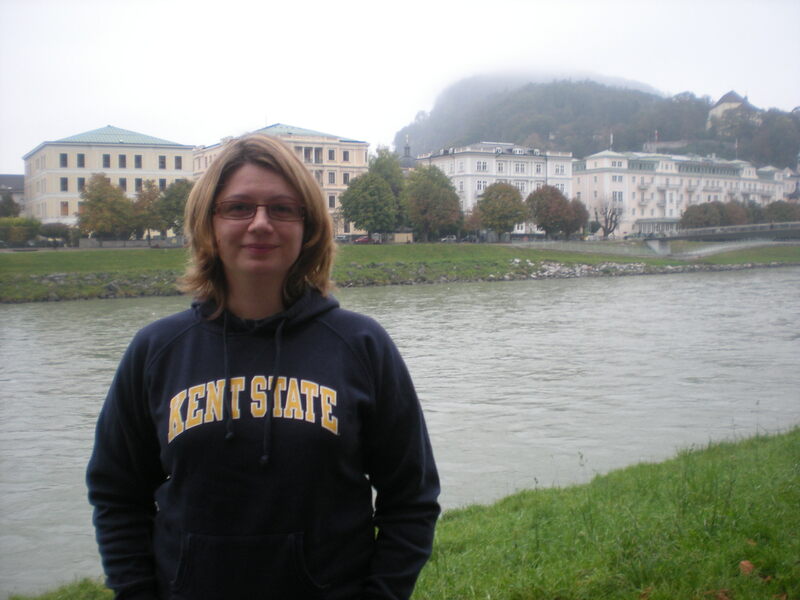 And Dad, Gyorgyi specifically wears the Kent State sweatshirt to get a picture in these various places with it. The Kent State sweatshirt is her own personal traveling gnome project 🙂 (www.travellinggnome.net)! Travelling Gnome project? Hahaha, that’s great!